The CDR method for determining the degree of polymerisation of anthocyanins optimises the method developed by Parsec. The results of this analysis, together with those of the analysis of total anthocyanins, tannins and HCl index are used by the MoxEasy (Parsec) software to determine the optimal oxygen dose for micro-oxygenation. The CDR WineLab® method is used, in a simple and fast manner, to perform the analysis of polymerised anthocyans directly in the cellar. It improves the analytical repeatability of the analysis developed by Parsec as the standard deviation passes from 1.8 of the reference method to 0.5 of the CDR method. The determination of the polymerised anthocyans is part of a broad analysis panel developed by the CDR laboratories, implemented on CDR WineLab®, which offers the oenologist a precise and accurate control of both the polyphenolic extraction phase in red wines (maceration), and of the subsequent polyphenol stabilisation phase (and therefore of colour stabilisation) that occurs with the micro-oxygenation process. To learn more read ”Controlling Maceration and Micro-oxygenation in the wine-making process“. 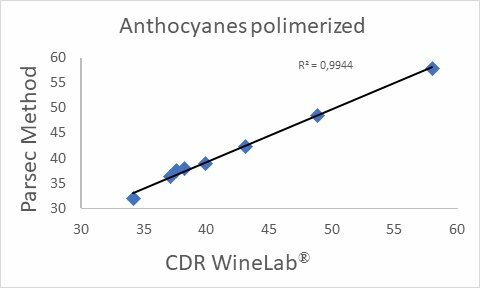 The correlation curve of the determination of anthocyanins polymerised in wine with CDR WineLab®, carried out with respect to the Parsec method. The method exploits the discolouration with SO2. The method is based on the variation in absorbency of the wine at 420 and 520nm. The ratio between the sum of the two optical densities before and after the addition of sulphur dioxide estimates the concentration of the polymerised anthocyanins in the sample. Wine: Use the wine as it is after centrifugation. Must: Use the must as it is after centrifugation and degassing. Polymerised Anthocyanins was last modified: February 25th, 2019 by CDR s.r.l.